Der Lehrstuhl für Mechanische Verfahrenstechnik an der TU Kaiserslautern erforscht eine breite Palette wissenschaftlicher Themen in nahezu allen Bereichen der Partikeltechnologie. Von der Generierung und Formulierung von Partikeln für definierte Eigenschaften disperser Stoffsysteme bis hin zur Separation der dispergierten Partikeln aus der Gas- oder Flüssigphase decken die Forschungsarbeiten des Lehrstuhls zentrale Grundoperationen der Mechanischen Verfahrenstechnik ab. Zur Charakterisierung der dispersen Stoffsysteme entwickelt der Lehrstuhl eigene Sensortechnologien, die nicht nur im Labormaßstab zum Einsatz kommen. Im Bereich der Feststoffverfahrenstechnik werden von den makroskopischen Effekten bei der Lagerung von Schüttgütern bis hin zur Betrachtung der Partikel-Mikromechanik zwischen Einzelpartikeln oder beim Bruch eines Partikels skalenübergreifende Phänomene experimentell und numerisch untersucht. Im Zentrum aller Forschungstätigkeiten steht die Entwicklung von individuellen Simulationsumgebungen, wobei insbesondere der Modellierung der mehrphasigen Strömungsvorgänge eine besondere Bedeutung zukommt. Innerhalb des PowderReg Projektes werden Probleme bei der Lagerung von Pulvern betrachtet, um Massenstromschwankungen und Fließprobleme zu vermeiden. Neben experimentellen Untersuchungen kommen numerische Methoden (Diskrete-Elemente-Methode & Computational Fluid Dynamics) für Simulationen von Siloentleerungen und Schervorgängen zum Einsatz, wofür mikromechanische Wechselwirkungen modelliert und kalibriert werden. In the framework of the European project “PowderReg”, the team of the university of Saarland is dealing with granular matter flow research. In the first year of the project we focused on developing and testing measurement techniques for the rheology of granular matter, and on setting up related experiments. For our scientific purposes, we use a standard rheometer in a cup and plate configuration to research granular matter samples with large amplitude oscillatory shear (LAOS). Our first results were presented at the Rheology 360 conference in Luxembourg (19.03.2018). During the first year, we also began to implement the first tube rheometer set-up. Fruitful collaboration within academic and industrial world helped us develop a work plan for 2018 and the following years. We discussed with Prof. Caceres (Balseiro Institute Argentina), summing-up the previous work carried out on powder flow to develop a theory on granular gases related to the van der Walls approach, and considering the necessity to find a suitable set up which could reconcile research and experiments. We carried out a discussion with Dr. Pedro Pury (FAMAF, Argentina) about granular matter rheology for studying the thermodynamics of the tube Rheometer. We also discussed about additional experiments with the tube rheometer in order to measure the dissipated energy and estimate the configurational entropy. We took contact with the company CERATIZIT, Luxembourg (www.ceratizit.com), and had three meeting in November and December (one in their industrial plant and two in our laboratories) focusing on the different stages of the metallurgical process they carry on to produce cutting tools. We structured our collaboration inviting the company to join the Committee for Innovation and Impact in order to further develop a cooperation about tasks related to innovation in powder processing technologies. study, we focus on the distribution of grain sizes. 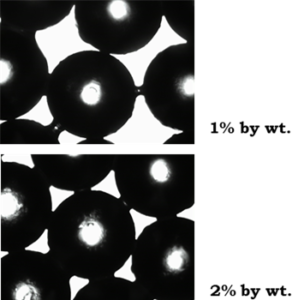 In particular, we present an experimental investigation of the packing fraction for various mixtures of spherical grains with different sizes. The compaction dynamics is also analyzed for different vibration strengths and orientations. measurements in the experimental studies. Carrying out particle-scale dynamics simulation with XDEM has the potential of providing detailed insights for exploring granular bulk behaviors. In the framework of this project, we will numerically probe the granular flow dynamics in two prototype systems: a Couette cell and an inclined plane. 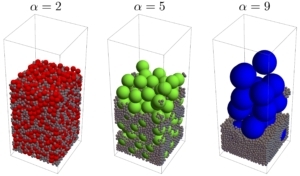 Ensemble averaging method is employed to derive macro-scale information such as stresses, strains and granular temperature from particle-scale interaction simulations. We aim to find out generalized relationships among flow dynamic parameters and formulate stress-strain rheological relationships for continuum model closure.